It is no health secret that fiber is big-time healthy for us. Its biggest role is in laying the groundwork for a well-oiled gastrointestinal system. It prevents a variety of diseases, very serious ones included. A new study says that fiber can help your gut create an environment filled with beneficial bacteria. This kind of bacteria is the reason why people care so much about probiotics, which are “friendly” bacteria. The new study shows that fiber can promote a shift in the gut toward a healthier balance of bacteria. The microbes in your gut can support a healthy gastrointestinal tract as well as affect our susceptibility to conditions as varied as type 2 diabetes, obesity, inflammatory bowel disease, colon cancer, and autoimmune disorders such as rheumatoid arthritis. The take-home message here is that we can improve gastrointestinal health by using fiber to cultivate health-promoting bacteria. It seems that fiber is good for more than just helping food move through the intestines. The issue: people generally get only about half the 30 to 35 grams of fiber recommended for each day. If you are serious about fiber, it’s time to read nutrition labels and choose foods that have high fiber content. In the good-quality study, 20 healthy men with an average fiber intake of 14 grams a day were given snack bars to supplement their diet. The control group received bars that contained no fiber. A second group ate bars that contained 21 grams of “polydextrose” — a common fiber food additive. The third group received bars with 21 grams of soluble corn fiber. The results showed that both types of fiber affected the abundance of bacteria in the gut. When soluble corn fiber was consumed, “Lactobacillus” increased. This type of bacteria is a heavyweight in the probiotics market, so this is good news. 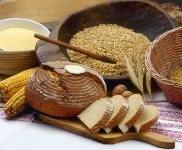 “Faecalibacterium” populations rose in the groups consuming both types of fiber. The shifts in bacteria seen here were opposite of the type you’d find in people with poor gastrointestinal health. This study even suggests that the healthy bacteria’s growth could be stimulated by using prebiotics, which are sometimes talked about in Doctors Health Press. These are foods that promote good bacteria’s growth. Probiotic supplements, of course, are what contain the live bacteria. In any event, there is good reason that fiber is listed on nutritional labels.